As every parent will know, once children enter the equation, even Valentine's Day will involve new ways of celebrating (I vividly remember one year, when my little boy was a baby, having dinner with his bouncy chain ON the dining table to keep him happy and entertained while also eating a romantic meal a deux). However, while romantic love should always be celebrated, of course, now that you are a mama, there are also so many new, fun new ways to celebrate the cutest Valentines of all—your children. You are never too young to state how you feel on a card – so get the whole family involved in making and writing (if they are old enough to) cards to each other. Start the day off in a cute way – use cookie cutters for all they are worth, because toast and bagels and everything, really, taste better when it is heart shaped. The simplest of sugar cookie recipes will do – today, it is all about the frosting and sprinkles. Valentine's Day cookies will be available for order tonight! ❤️ Woohoo! I will post again when the order form is ready! Last year I sold out in less than 24 hours, so if you are interested in ordering don't hesitate. Pick-up will be available in both Bluffdale and Grantsville. Thank you! It doesn't have to be complicated or time-consuming – some bunting and a few heart-shaped balloons will be more than enough to set the scene. Salty pretzels drizzled with melted while chocolate, marshmallows and sprinkles is in every way the perfect Valentine's Day snack. Lady and the Tramp is a good one for younger kids, for slightly older ones, how about a classic like "My Girl" or any cute or romantic comedy will do too. 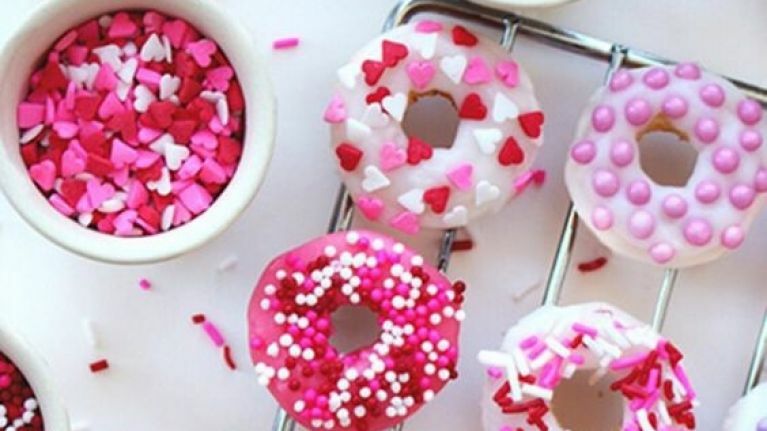 Donuts are (still) having a moment, and for Valentine's, we say go all out. ?You donut know how much ? we love you. Who needs ?flowers when you have donuts?!? ? : @krispykreme ? : @whatchewwant #️⃣ : #donutscookiesandcream ? ?TAG YOUR FRIENDS!!?? These pink ones are bound to go down a TREAT. Because your kids will love doing this with you – and because you'll have some seriously cute and sentimental decorations at the end. If you are the mama of a little girl, take the opportunity to celebrate all things girly on this day. Bonus points for twinning!